I don't see a lot of movies at the theater, partly because I've been pretty busy, but mostly because very few of the ads I see make me interested in the films they are advertising. However, I knew before I ever saw an ad for it that I would want to see this film. First, it's the opening movie in The Hobbit trilogy. I am not in any way, shape or form an expert on Tolkien. In fact, I have yet to make it through even the first book in The Lord of the Rings trilogy, though I've started it several times. I have, however, read The Hobbit more than once and listened to it on CD. (In that format, the songs are really, really tedious and long, but that's a separate issue.) I was very interested to see what they would do to make this rather slim book into a three-movie epic, especially since they made only three movies for the entire much longer and much more involved Rings trilogy. Second, I very much enjoyed the Rings movies. They were richly and beautifully filmed, well acted and very touching. I figured no one could do justice to The Hobbit better than director Peter Jackson. I wasn't sure what I would think of him with long hair and a long beard and shrunk down to dwarf size (oh, those beautiful long legs! ), but he did not disappoint. 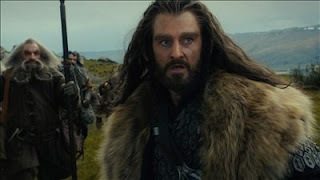 He is riveting as Thorin Oakenshield, leader of the band of dwarfs who take reluctant Hobbit Bilbo Baggins on his unexpected journey. I have always loved Richard Armitage's voice, low and somehow intimate and always captivating, but I didn't know he could sing, too, and very beautifully. 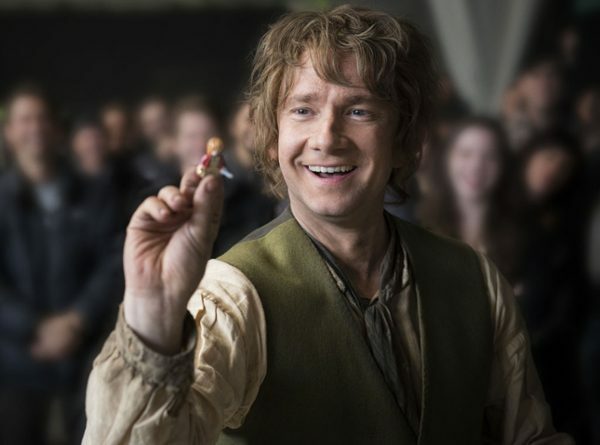 I very much enjoyed Martin Freeman as Bilbo, too. To me, he had the right combination of reluctance and determination for the role, seeming to surprise himself as much as others with his courage and tenacity. What didn't I like in this movie? Mostly Radagast the Brown. The minor wizard is mentioned only briefly in the book, though he does appear in some of Tolkien's other works. I found his portion of the movie rather slow and, how else can I say it?, stupid. He has a bird's nest with live birds on top of his head (cute! ), and they have left their waste down the side of his face (not cute!). 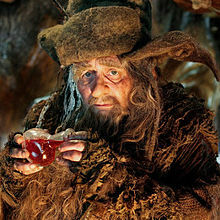 As portrayed by Sylvester McCoy, Radagast seemed irritatingly foolish and far too cartoonish for my taste. Some reviewers have mentioned that the entire film drags, but that was not my experience at all. I was surprised when what I knew was a very long film seemed to be over so quickly. There was adventure and humor and action and a rather amazing variety of fantastic creatures (the Goblin King was particularly horrible and well done), and it may be the most beautifully filmed movie I have ever seen. I am certainly looking forward to more. 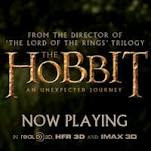 Overall, I thought The Hobbit: An Unexpected Journey was great fun well done! Have you seen The Hobbit? What did you think of it? I didn't see it. Yet. when I went to see Les Miserables, there were about five movies out at the time I wanted to see and this was one of them. Thanks for the review DeAnna. I admit my #1 reason to see it would be your #3 only because I have yet to make it through an entire LOTR movie. I need someone to walk me through the plot! I am sure it's just an incredible visual 'feast' and I'll let you know what I thought after I see it. Thanks for the review, DeAnna. I haven't seen this yet, but was wondering. is it on DVD yet? I know we'll watch it eventually, but it definitely won't be at the movie theater. Yeah, Deb, RA was probably THE reason I wanted to see this movie most, but I did enjoy the other movies (took me a few times to get up to speed on all the nuances, but they really are masterpieces). I think you'd enjoy this. It's just fun and amazing. Oh yes, we all enjoyed the Hobbit very much. We saw it New Year's Eve with the kids, my dad, and my best friend...everybody liked it and none of us thought it dragged. Although I'm with you. Radagast's bird friends grossed me out. I could have done with out Radagast entirely, but I suppose his part of it will tie into what's coming up. I haven't seen The Hobbit yet. Looking forward to the opportunity. My husband and Son went, and loved it. Ethan came right home and wanted me to download the song the dwarves sing from iTunes. I think you'd enjoy it, Lisa. It's fun. I didn't know RA could sing, and yes, that's really him! No, I haven't seen it yet. JJ bought the trilogy and the boxed set is sitting on the 'up for reading' table in our living room, but Nelson keeps passing over it to get to the Love Inspired Suspense. This morning, since he's caught up on all the LI's and LIS's, the choice was The Hobbit or the Love Inspired Historicals. Again he passed over The Hobbit and picked an LIH. Yet he prefers Sci-Fi over History channels. Go figure.